Avid waterfowler Todd Gifford (right) relies on Federal Premium Black Cloud TSS in challenging hunting situations like the hunt on New Year's Eve 2018, when birds flew by at distances just outside of typical shooting range for waterfowl hunters. In a previous Grand View Outdoors article titled, Ringing in the New Year — Honker Style, I wrote about spending my New Year’s Eve 2018 in a goose blind with my son, one of his best friends, and my hunting buddy Todd Gifford (photo above). We had tough hunting that day due to a combination of weather factors. The relatively warm temps for southeast Minnesota meant that Canada geese didn't have to feed for long periods to survive, and snow-free agricultural fields provided them with nearly limitless amounts of picked corn. During our New Year’s Eve goose pursuit, Todd handed us some ammo in the blind that I’d never seen before. As this illustration shows, Flightcontrol steel pellets exit the barrel first, followed by the smaller and more numerous TSS pellets. Each Federal Premium Black Cloud TSS shell is a 60/40 blend of Flitestopper Steel and Tungsten Super Shot (TSS). The pellets are contained in a Flightcontrol wad. That’s important because the rear-deploying petals prevent the wad from disturbing your shot pattern. The system works with either a ported and standard waterfowl choke. In addition to the high-tech wad, the ammo features an efficient Catalyst lead-free primer and clean-burning, temperature-stable propellant. The folks at Federal claim that both of these components work together to significantly decrease residue. Our group didn’t shoot enough on our New Year’s Eve hunt to realize the benefits of the reduced residue. Still, assuming residue is reduced, a shooter who prefers a semiauto shotgun will benefit because his or her shotgun will cycle shells better. As for the business end of Black Cloud TSS: Tungsten Super Shot has a density of 18g/cc, is 56 percent denser than lead (about 12 g/cc), and more than twice as dense as steel (about 8 g/cc). Why does this matter? Because the pellets are so dense, they penetrate deep, even when those pellets are small. How small? This is not a misprint: Black Cloud TSS is available in two duplex configurations for 12 gauge: BBx7 and 3x9. The former contains BB steel combined with No. 7 TSS. The latter contains No. 3 steel combined with No. 9 TSS. Because the TSS pellets are so small (Nos. 7 and 9s), Federal can increase the pellet counts in these 3-inch shells dramatically over previous offerings. Consider this: A standard 3-inch 1.25-ounce BB shell has 90 pellets, but the Black Cloud TSS in BBx7 (think of it as the goose offering) has 140 pellets including 56 size BB Flightstopper steel pellets and 84 No. 7 TSS pellets. A standard 3-inch 1.25-ounce No. 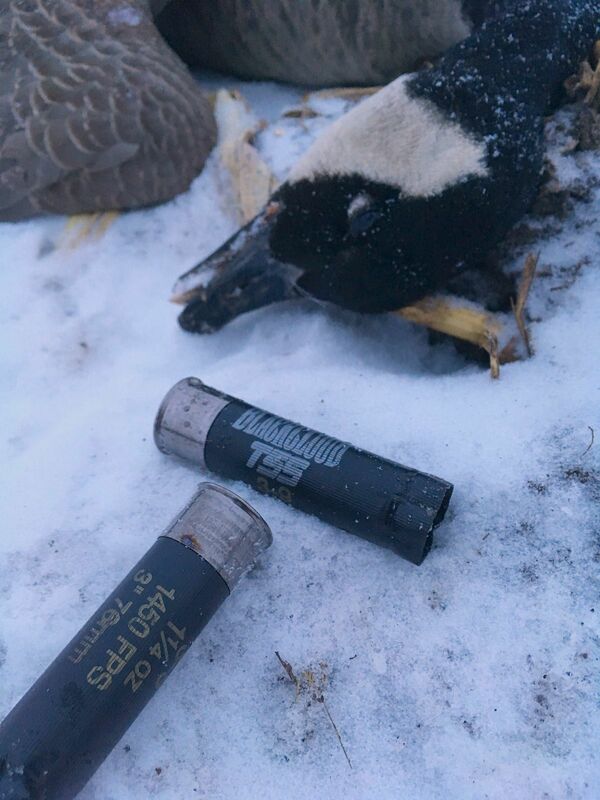 3 steel duck load has 197 pellets, but Black Cloud TSS in 3x9 has 270 pellets including 108 size No. 3 Flightstopper steel pellets and 162 No. 9 TSS pellets. More pellets means more kills, provided the smaller pellets do their job, correct? In penetration tests using ballistic gelatin, the steel BB penetrated 4.75 inches and TSS 7s penetrated 6.25-6.5 inches. With the 3x9 load, the steel 3s penetrated about 2.5 inches, and TSS 9s penetrated 4 inches. TSS pellets are smaller but they penetrate deeper. Plus, you have more of them in the air. In a word: deadly. All of this math aside, what it boils down to in simplest terms is Black Cloud TSS enables hunters to drop ducks and geese at long range. Sure, you still need to be on target for the ammo to do its job. But it’s comforting to know that during those times when you misjudge the range, and you think a goose is 40 yards but it’s really 50, or 55, the ammo is up to the task. Black Cloud TSS is lethal, but expensive. The author plans on using it only in special circumstances. Of course, you pay for this prime performance. The MSRP for a box of 10 Black Cloud TSS is $41.95. Actual street price, however is more like $30. Yes, that still means $3.00 per trigger pull. If you buy a case of the ammo (10 boxes = 100 shells), I’ve seen street prices as low as $270, or $2.70 per trigger pull. Regardless, the ammo is super expensive. Hopefully, the prices will come down over time. I certainly can’t afford to shoot this high-dollar ammo all the time. If the waterfowl action is steady and shots are numerous, I’ll grab for my 25-count boxes of duck and goose loads (3-inch steel) that cost $15. That said, during those tough hunts when it becomes clear that I might get only one or two shots at the end of hunting time to drop a single high-flying goose, I can see myself loading up with TSS.